This is the E page of our A to Z guide to plants -- how to care for them, landscaping with them, and cooking and healing with them. This is a truly fabulous flowering vine, one you will covet for your garden as I did as soon as I saw the flowers especially as they sat against the backdrop of deep green flourishing leaves. Benefits: It may have some medicinal benefits, but I didn't find anything specific. From: The Far East and China. I think I read somewhere that in Thailand this vine is seen almost everywhere. Planting and care: This wonderful vine loves full sun and will grow to 20 feet or more, flowering in the cool season of a hot climate. It requires water, but is not greedy about it. Probably the easiest way to make a new plant is to cut one of the sturdy stems and stick it in a semi shady soft soil area that will be kept relatively moist. The other method is to retrieve seeds from the 6 to 8" long, 3" diameter deep green smooth seed pods you may find on the vine. We haven't seen any of these pods here in Guatemala so there may be a special pollinator that does not reside here by the lake. 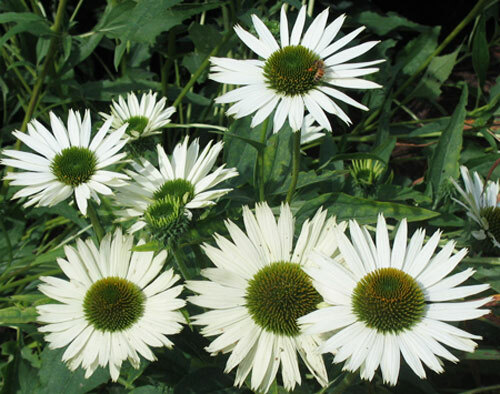 Benefits: Comments on the curative capabilities of echinacea vary widely. Its sales numbers are impressive, but research to date hasn't proven its effectiveness. 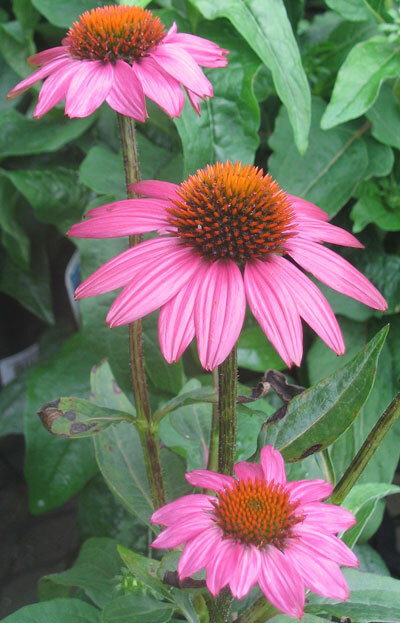 It is believed American Indians made use of echinacea in some form, but only for minor ailments. Photographed: As is noted below. 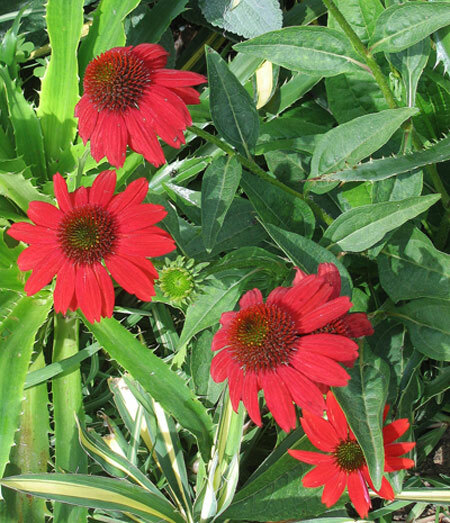 Planting and Care: These are frost and drought-tolerant long blooming perennial plants growing up to 3 or 4 feet tall. 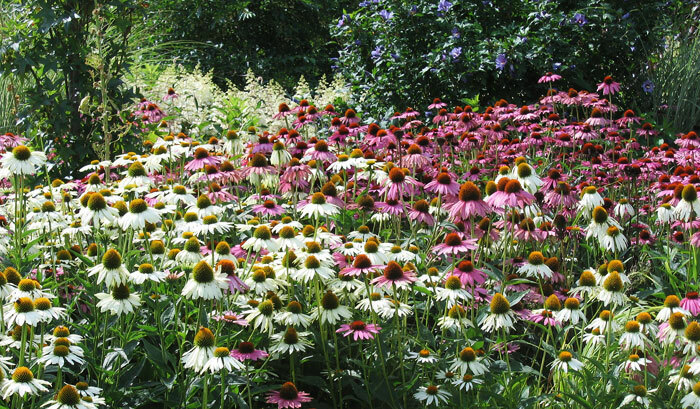 Plant seeds early in the season to ensure blooms before winter arrives. 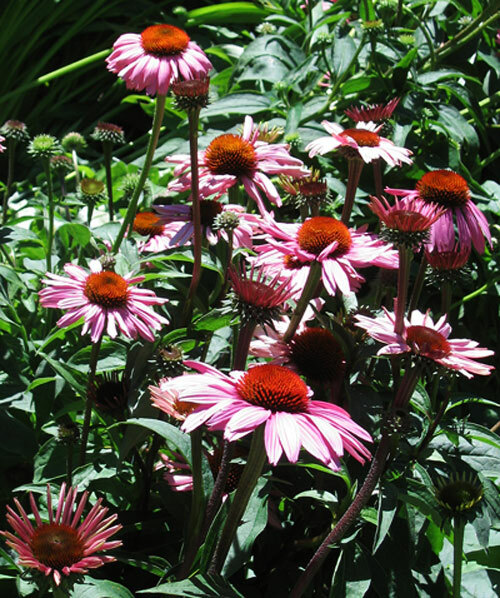 Echinacea likes good soil with a neutral ph. In cooler climates it will do well in full sun. In warm climates, give it a rest from hot afternoon sun. Photographed: Somewhere on the road in Rhode Island in in 2013. Photographed: In the Winter Garden in Wellington, New Zealand, in 2013. A member of the potato family, eggplant has wormed its way into our hearts and tummies, though it is sometimes said to have almost no food value. 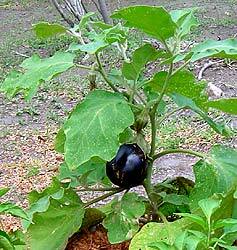 Planting and Care: Eggplant loves warmth and lots of water. The seeds have to be soaked in water the night before planting to encourage germination. We have grown it very happily in pots in both Montserrat and in Taxco and it seems to do as well set out in the garden. 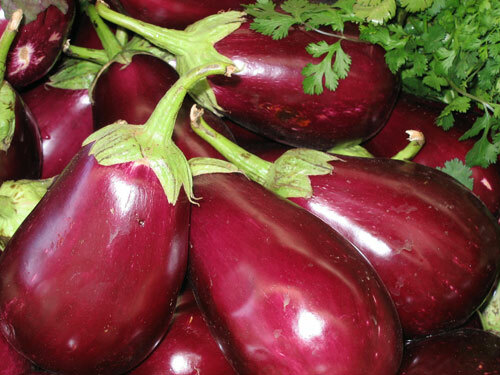 Eggplants are ready for harvesting when they give slightly when squeezed. The fruits may become bitter in hot, dry weather, but the plant will recover when cooler weather arrives. 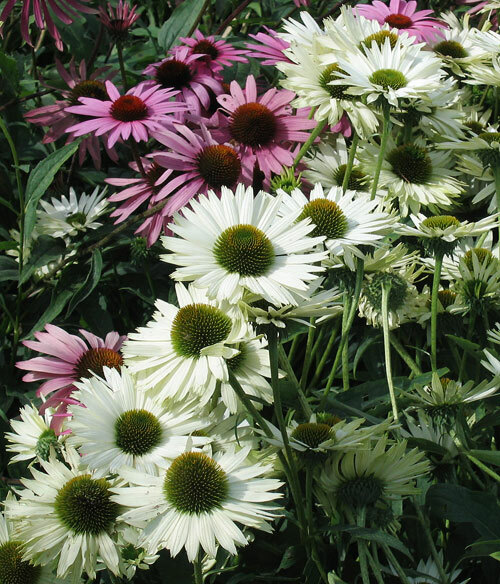 Varieties: I don't know the name of the purple and white variety that was a part of the Montserrat Department of Agriculture's planting program one year, but I would not recommend it. It produces very small eggplants which go from purple and white and ripe to yellow and over ripe in just a couple of days. We now have seeds for two new varieties from Greece, both are black, but "one is long for slicing and the other is round for stuffing," so we were told in fine English at a plant and seed store on the island of Corfu. This plant looks very much like a non-vining version of the standard philodendron which grows in offices and homes with little or no care. The leaves are a bit more bumpy and grow to be about the size of my hand. 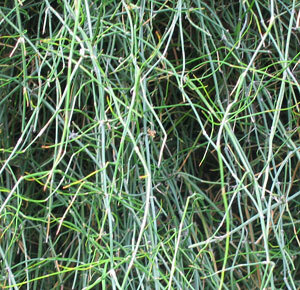 Benefits: This plant is used in traditional Chinese medicine, but as it is poisonous it is used only in external applications. 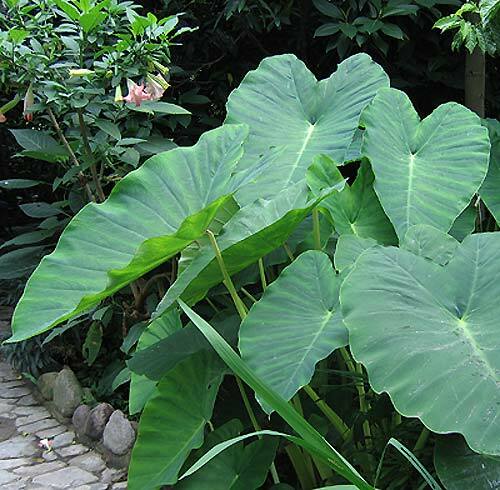 Planting and Care: The Chinese taro requires bright shade, lots of moisture and rich loamy soil. 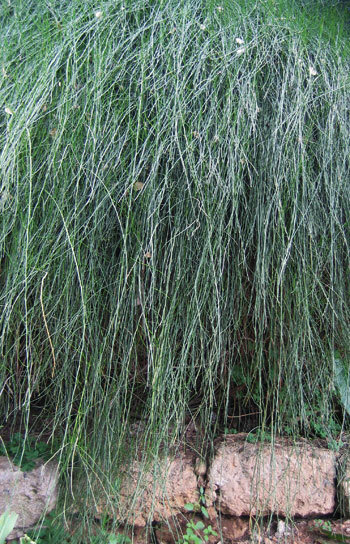 It is one of the smaller members of its family and will grow to be only a little over 3 feet high. This is a large climbing plant whose leaves were once used in Montserrat as "wrappers for stewed foods and as umbrellas." Benefits: This variety of elephant ear can be used as a wrapping for food, but check with someone who has actually seen this done before going ahead with it. Photographed: In our shady terrace garden on the left and just at the end of our upper garden at our former home in Montserrat. 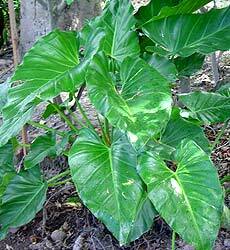 Planting and Care: It grows especially well in bright shady areas. 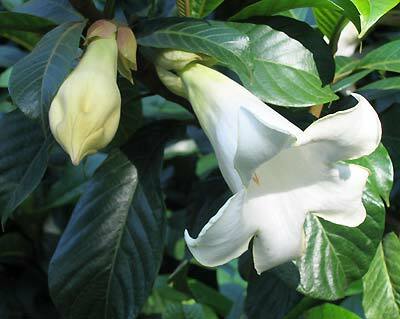 It is exceptional in its adaptability as it will also grow, though less beautifully, in sunny areas. 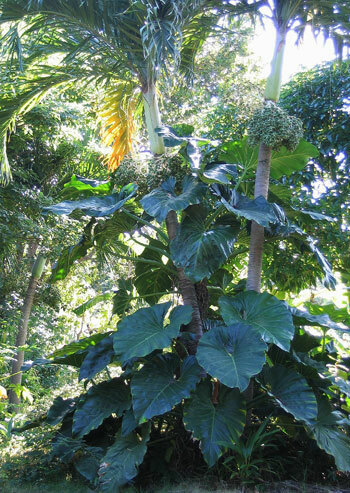 To transplant an elephant ear plant you simply have to pull it up and place it where you'd like it to be on any loosened decent soil. Give it some water for a week or two and it will be off and running. 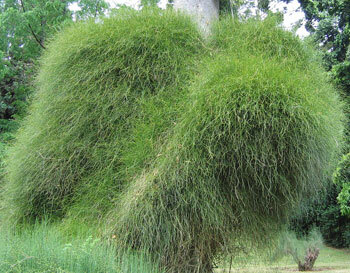 It is my ideal type of plant. Surprisingly there are large to huge leaved varieties that are identical in all characteristics except leaf size. 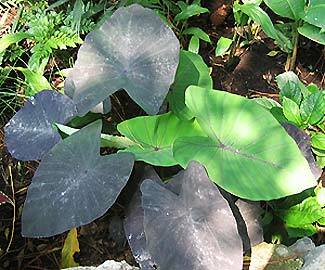 This elephant ear has huge leaves with a flat, not shiny, finish on the surface. It will grow to be at least 5 feet tall. Benefits: It is believed to have beneficial medicinal qualities and it can be eaten, but only after it is well cooked. 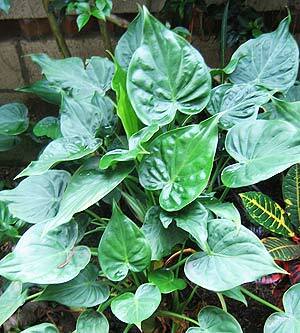 Planting and Care: This elephant ear likes a moist rich loamy soil. It will do best with morning or late afternoon sun, avoiding the bright heat of mid day sun. It will also readily accept a bright shady area of the garden. Warning: All parts of the plant are toxic when fresh. Benefits: If you have problems with deer and rabbits in your garden, this might be a good choice. 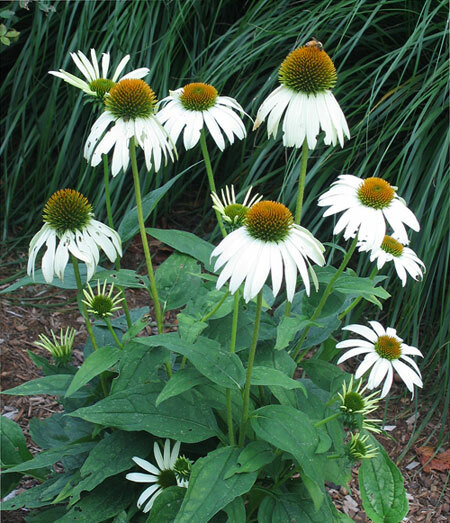 Planting and Care: This is a perennial plant that will appreciate finding a home in fertile moist soil in a lightly shaded garden area. It will grow to be three feet tall and wide. It is not frost hardy. Warning: All parts of this plant are poisonous if eaten fresh. This herb is commonly used in Mexican cooking; it is almost always added to a pot of black beans just before they are finished cooking to enhance their flavor and to reduce abdominal gas. Clamoli, one of our favorite Mexican dishes, is also flavored with epazote. Benefits: Aids digestion and kills intestinal worms. It was and may still be used to treat malaria. Photographed: In our garden and in our kitchen at Lake Atitlan in Guatemala, 2014. 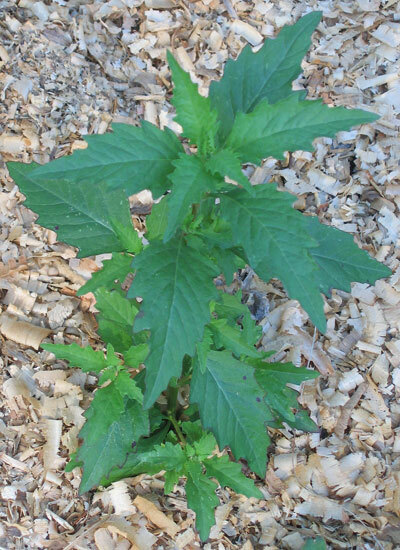 Planting and Care: Epazote grows hither and yonder of its own accord. I don't believe there is any significant commercial farming that includes epazote. We've had it in our garden for some years only because it arrived on the wind and we let it grow wherever it landed which included walk ways, the lawn and gardens. It does have a season known only to itself so there will be times when there is none to be had at our home or in the market. Whenever we have had or bought epazote with seeds, we let them dry a bit and then drop them where we'd like to see it grow. 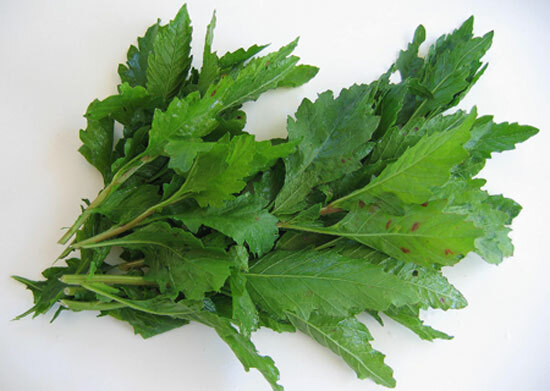 Benefits: It is a source of ephedrine and pseudoephedrine and may have other medicinal qualities. 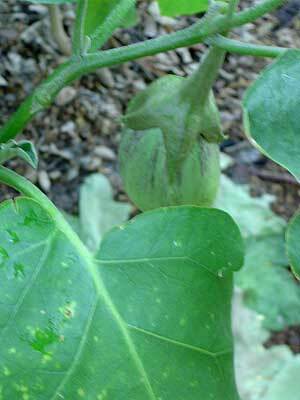 Speak with your doctor before ingesting any part of this plant. 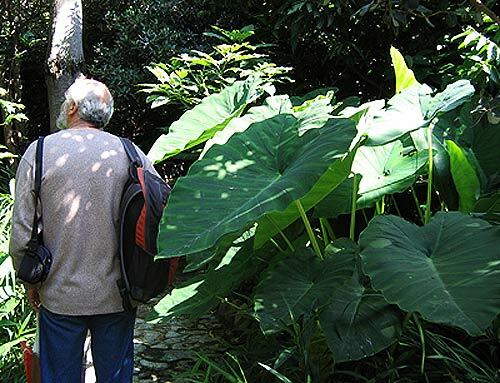 Photographed: To the left and right in the Botanical Garden in Naples, and below in Palermo, Italy. 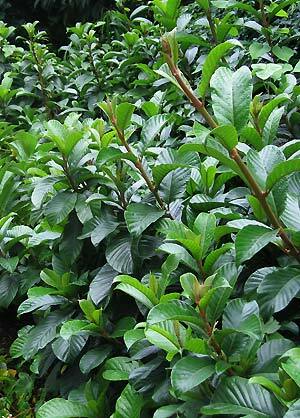 Planting and Care: Growing to be about 6 feet in height, this is an evergreen shrub. 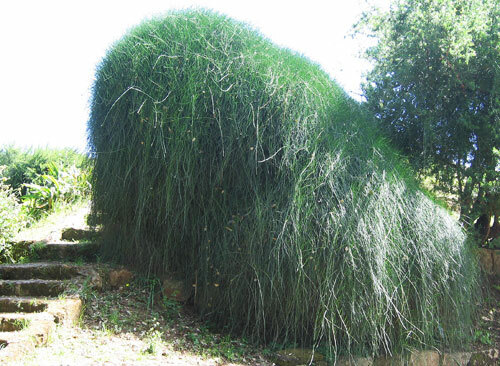 It will grow best in sunny dry conditions perhaps as part of a rock garden. This is normally considered a very healing plant though I have what seems like an allergy to it and its aroma even in throat lozenges. 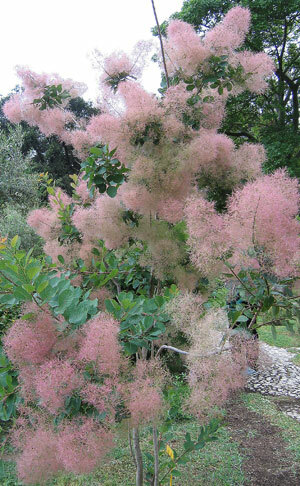 It is a lovely fast growing tree with pale gray round leaves which can eventually grow to be about 100 feet tall. 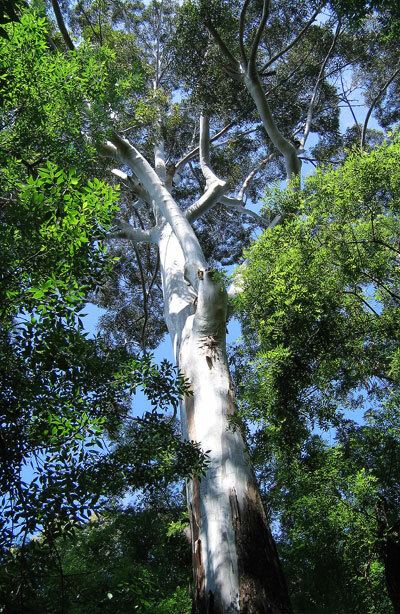 Large eucalyptus trees are majestic in the landscape, but they have their downside too. These trees are fast growers and they absorb all available ground water leaving little for anything else to grow. In Uruguay we saw a huge amount of acreage devoted to producing eucalyptus firewood. Wood is a very commonly used heating fuel there though I can't recommend it as it seems to give off some unpleasant aromatics. Here in Guatemala there are two of these trees adjacent to our property and I delight in them every day. From: Australia where they provide habitat for the koala bear. Planting and Care: My best suggestion is to contact your local college or university agricultural department for advice. From: The warmer parts of Europe and all the way east to the warmer parts of China. Planting and care: Tolerant of different pH levels and poor soil, it does like to be planted in full sun.